Chartwell was the much loved Churchill family home and the place from which Sir Winston drew inspiration from 1924 until the end of his life. 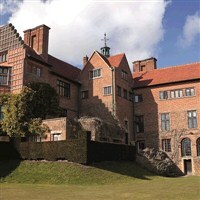 Bought by Sir Winston Churchill for its magnificent views over the Weald of Kent, Chartwell was his home and the place from which he drew inspiration from 1924 until the end of his life. The rooms remain much as they were when he lived here, with pictures, books and personal mementoes evoking the career and wide-ranging interests of this great statesman and many of Churchill's paintings can be seen in the studio. The hillside gardens include the lakes he created, Lady Churchill's Rose Garden and the kitchen garden.